Alex' Happy Map of the USA. © Alex Sumner 2011. All this talk about Sarah Palin and her “Blood Libel,” has got me thinking. One of the theories being bandied about is that the Arizona shooting took place because Palin drew up a map of America with a load of cross-hairs on it – one of them being on Tucson – hence causing Jared Lee Loughner to pick it to go on a killing spree. Well I am going to put this theory to the test! 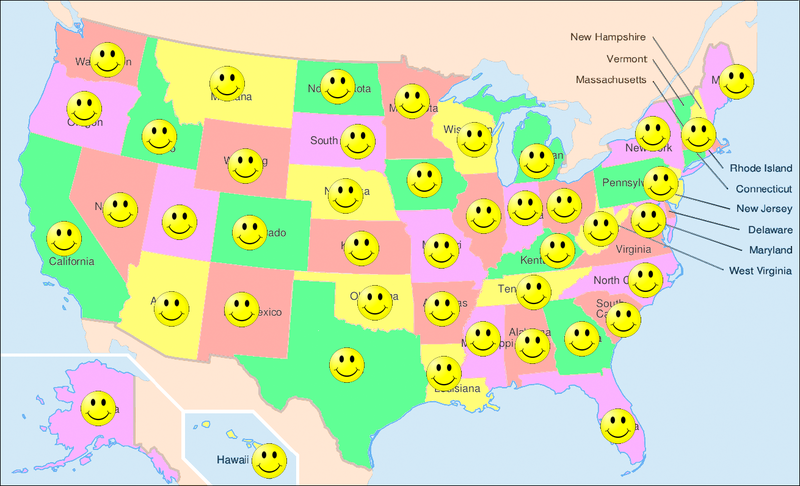 I am going to draw up my own map of America, but instead of putting cross-hairs on it, I shall put smiley faces on it, so that instead of violence, random acts of kindness will break out all across the USA (see picture).